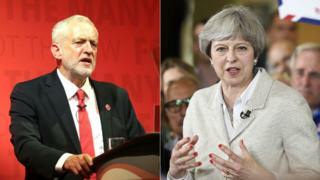 Jeremy Corbyn has said Theresa May should pay a price in Thursday's general election for ignoring "repeated warnings" not to cut police numbers. The Labour leader said Mrs May had "presided" over a 19,000 fall in numbers as home secretary and he agreed with those calling on her to resign in the wake of the London Bridge attacks. But the PM said she had protected counter-terror police numbers. And she accused the Labour leader of opposing shoot-to-kill powers. 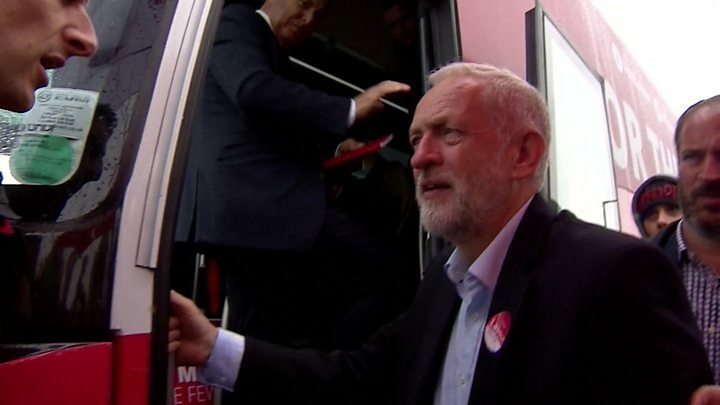 With less than 72 hours to go before Thursday's election, party leaders have returned to the campaign trail after electioneering was briefly suspended because of the London Bridge attack, in which seven people died. How has armed policing changed? Following a meeting of senior ministers and security chiefs at the emergency Cobra committee, Mrs May said Saturday's atrocity was an attack on "the free world" and said she was best equipped to deal with the "evolving" threat facing the UK. In a speech in London, she vowed to tackle the "whole spectrum" of extremism, promising action in communities and online to ensure "bigotry and hatred" did not escalate into violence. She defended her record on security over the past seven years in the face of criticism that she had presided, as home secretary, over a fall of 18,991 in police numbers between September 2010 and 2016 and that she had accused officers of "crying wolf" over their capabilities. She said she had protected counter-terror police budgets as home secretary and was now "providing funding for an uplift in the number of armed officers" as well as protecting funding for the police as a whole. Insisting strong leadership was "absolutely vital" for keeping the UK safe, she said Mr Corbyn had "boasted" of opposing all counter-terrorism legislation as a backbench MP and had voiced his opposition to shoot-to-kill powers, saying the rapid response of the police to Saturday's attack showed how vital these were. But as he embarked on a whirlwind series of campaign events planned for the next 72 hours, Mr Corbyn said there was "deep anger" at the number of police and firefighters who had lost their jobs in recent years. Asked whether he agreed with a call by some, including former Downing Street adviser Steve Hilton, for Mrs May to quit, he said he did, but added that the "best way" for the issue to be dealt with was by voters on Thursday. "There is an election, everybody has a choice. A lot of people are very angry and would have wanted her to resign were she still home secretary. "The choice is going to be made on Thursday by the people of this country." Voters choose their political parties for all sorts of different reasons. But as this strange election hurtles towards its close, the demand of who can keep the country safe is firmly on the table. For Theresa May that doesn't just mean questions over how she would counter extremism if she stays in power. She faces criticism too over the Tories' record on squeezing money for the police. 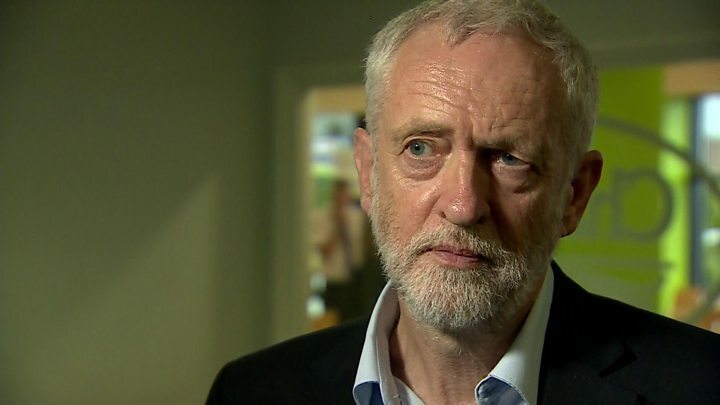 Labour leader Jeremy Corbyn has repeated his promise to reverse the cuts and slammed the Tories, warning the government could not "protect the public on the cheap". He also tried to counter perceptions that he is soft on security, including his earlier stance on shoot-to-kill, which he questioned days after the Paris attack at the Bataclan. He said, if he were prime minister he would take "whatever action is necessary and effective" to protect the public. After a brief pause, the election campaign is well and truly back, even if with a more subdued tone, and with security as its primary subject. Lib Dem leader Tim Farron has accused the Conservatives of making the "wrong choices" over police budgets, "posturing" over internet surveillance powers and not putting enough pressure on allies in the Middle East to turn the screw on extremist groups. "Fewer police on the beat means fewer conversations, less information being passed on and less knowledge about who's who and who needs to be kept under surveillance," he wrote in an article for the Guardian. He added: "Theresa May talks of the need to have some difficult and sometimes embarrassing conversations. "That should include exposing and rooting out the source of funding terror, even if it means difficult and embarrassing conversations with those like Saudia Arabia that the government claims are our allies." He also warned about the UK seeking to "control" the internet in a manner associated with regimes like North Korea after the PM called for new measures to "regulate cyberspace" in order to prevent vulnerable people being radicalised online. 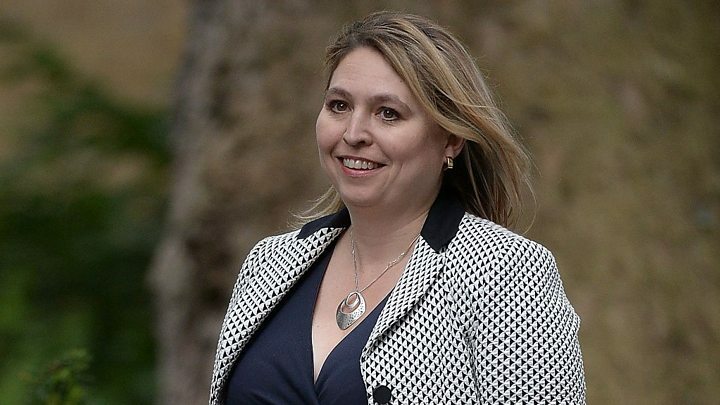 Culture Secretary Karen Bradley told the BBC that the fight against online radicalisation meant getting "access to information as required" from tech firms. 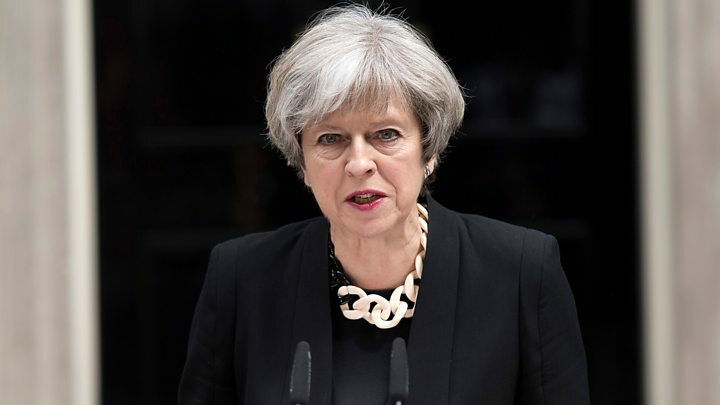 Pressed on whether this meant penetrating encrypted messaging services, she said the tech industry had done the "right thing" in the past in terms of removing indecent images from their platforms and now ministers wanted the "same response" over extremist material. "We know it can be done and the internet companies want to do it," she told BBC Radio 4's Today. UKIP leader Paul Nuttall has repeated his call for British citizens who travel to Syria or other countries to fight for so-called Islamic State to have their passports revoked and not allowed back into the country. SNP leader and Scottish first minister Nicola Sturgeon has sought to contrast the party's record in government with that of Mrs May's, saying police numbers had remained at least 1,000 higher than those it inherited in 2007. "We're not immune from these threats, but unlike other parts of the UK we have also maintained police numbers and increased armed policing," she said.